Zinrelo is a modern-day loyalty rewards program, helping to maximize per-customer revenue through 360-degree customer engagement. It supports omni-channel interactions including desktop web, mobile web, mobile apps and in-store engagements. Zinrelo’s loyalty program helps you to create fiercely loyal customers that are rewarded not just for purchases but also for all forms of engagements such as social advocacy, reviews, sign-ups, referrals, photo sharing and more. It is fully customizable and is extremely easy to deploy. 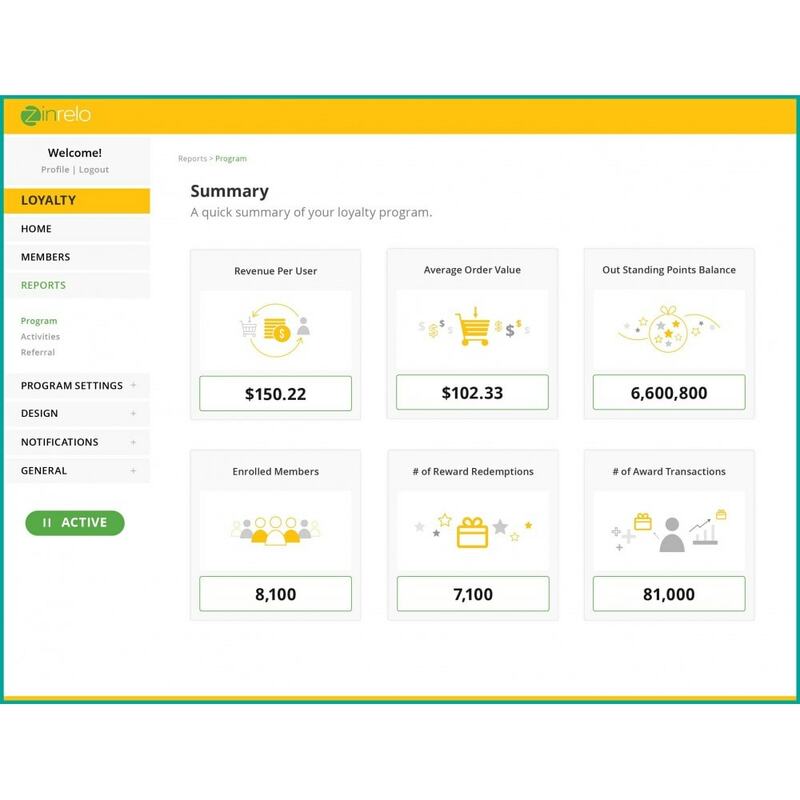 Zinrelo offers attractive pay-as-you-go pricing. The pricing tiers are a combination of the features and the number of enrolled members. 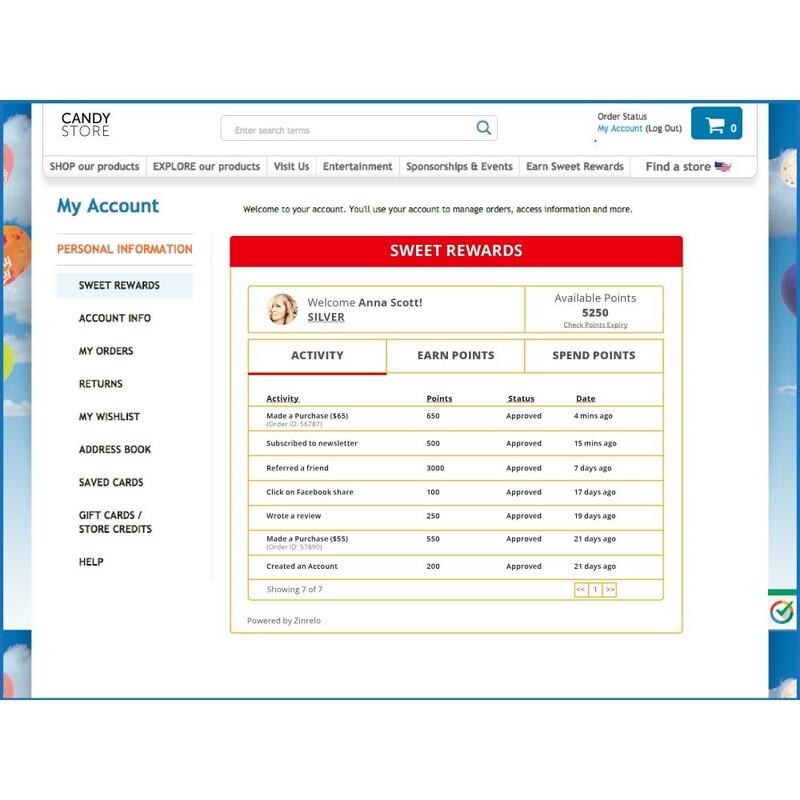 The loyalty rewards program can be deployed seamlessly across desktop web, mobile web, mobile apps and in-store environments. A mobile SDK is available to integrate the loyalty rewards program in your Android or iOS app. Birthday bonus: 200 points for Gold Tier, 300 points for Platinum Tier. Zinrelo is a fully featured loyalty rewards platform. Zinrelo loyalty rewards program helps you to reward your customers in multiple ways. You can add custom activities and engage your customers in 10+ ways. Purchases - Reward your customers for making a purchase on the website, in-store or via telephone. Customers can redeem their points for attractive gift coupons, % discounts, free shipping, cash-back, store credits etc. Referrals - Grow your customer base via word-of-mouth advocacy. Reward points for referring friends. You can incentivize both the referrer and the referee. Newsletter subscription - Give points to your customers for subscribing to your brands newsletter. You can share updates about the latest offerings via the newsletter. We recommend higher points for this activity for your customers will subscribe to your brands newsletter once in their lifetime. Reviews - Reviews from your customers are special and also helps other users visiting your website in decision making. Why not give your customers points for writing reviews? Reward points on Birthday - Birthdays are special and truly memorable. Give points, presents to your customers on their birthday. Winback Bonus - Win back inactive users who have been dormant for months by giving them special points offers on their next purchase. 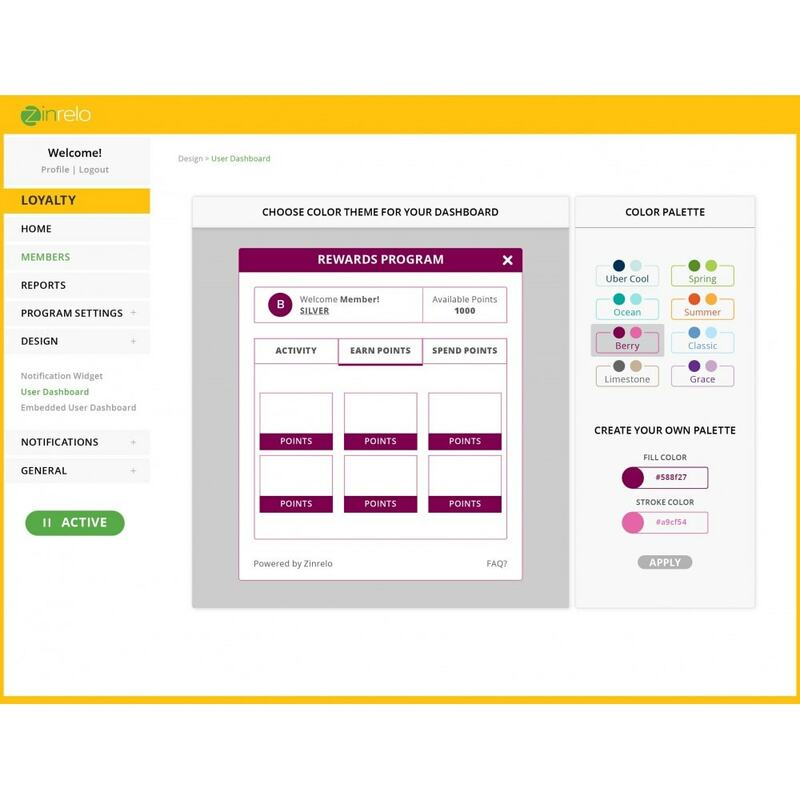 Zinrelo offers many more activities for your brand to create 360-degree engagement with your users on a continuous basis. You can also add an unlimited number of custom activities using real-time or batch-mode integration. Fully customizable, completely flexible : You can get started within minutes with an out-of-the-box loyalty rewards program. Or customize it the way you want. 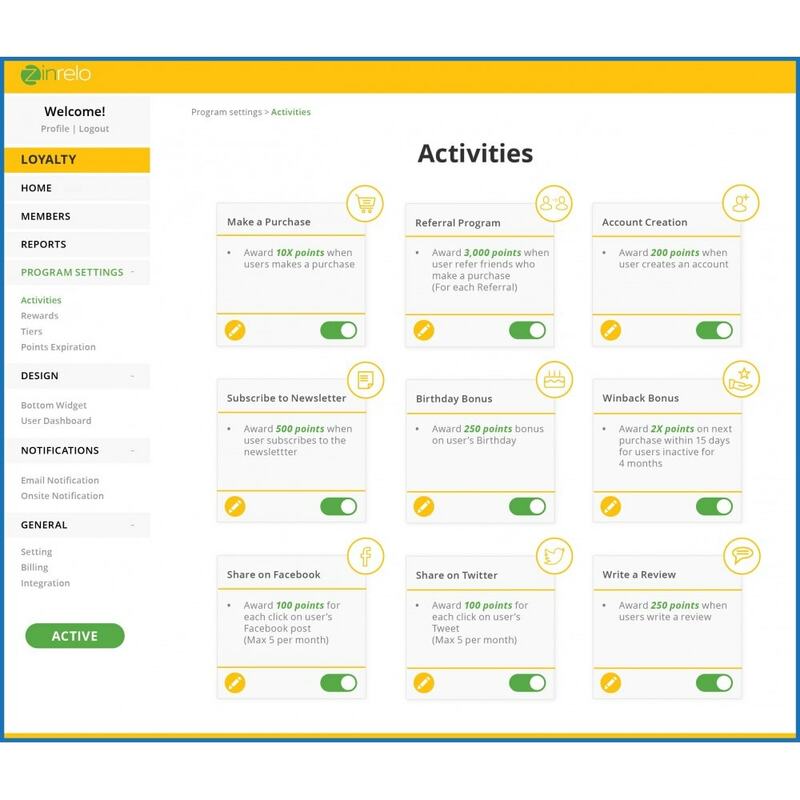 Add custom activities, build your own dashboards, create custom views or integrate with your CRM using the powerful Zinrelo API. 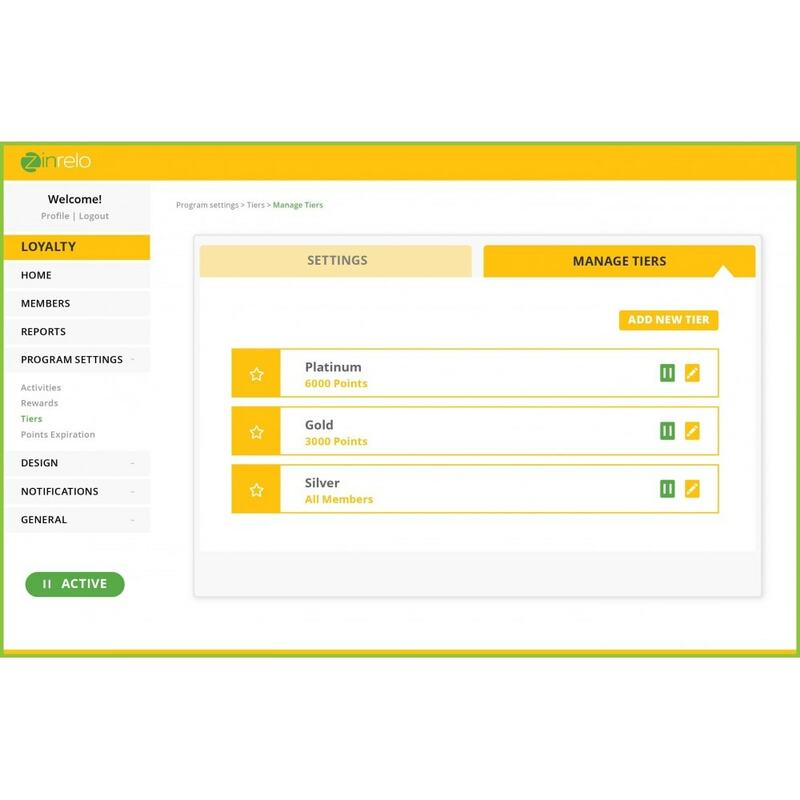 Zinrelo is the only API-first loyalty rewards program that can be built completely using published APIs. Loyalty Tiers - You can add tiers to richly reward more loyal customers and make them feel special. Once they reach a higher tier, they will never want to go back and become fiercely loyal. Flexible redemption options - Choose from a variety of redemption options including cashback, store credit, gift cards, in-store printable coupons, discounts on select products or apply points towards purchase. Custom redemption options can be created easily using the Zinrelo API. Custom email and in-built notifications - Automated, trigger based loyalty notifications to boost participation. Customize email notifications for various triggers such as points earned, new tier reached, approaching new tier, new redemption, points expiration and more. Instant, on-site notifications for points earned for any action. Maximizes enrollment and engagement. ROI based reporting - Understand the impact of the loyalty rewards program on your business. View detailed reports showing changes to critical business metrics such as revenue per customer, repeat purchase frequency, average order value, number of active loyalty members, points earned, points redeemed etc. Reports can be seen online or delivered automatically to your mailbox. 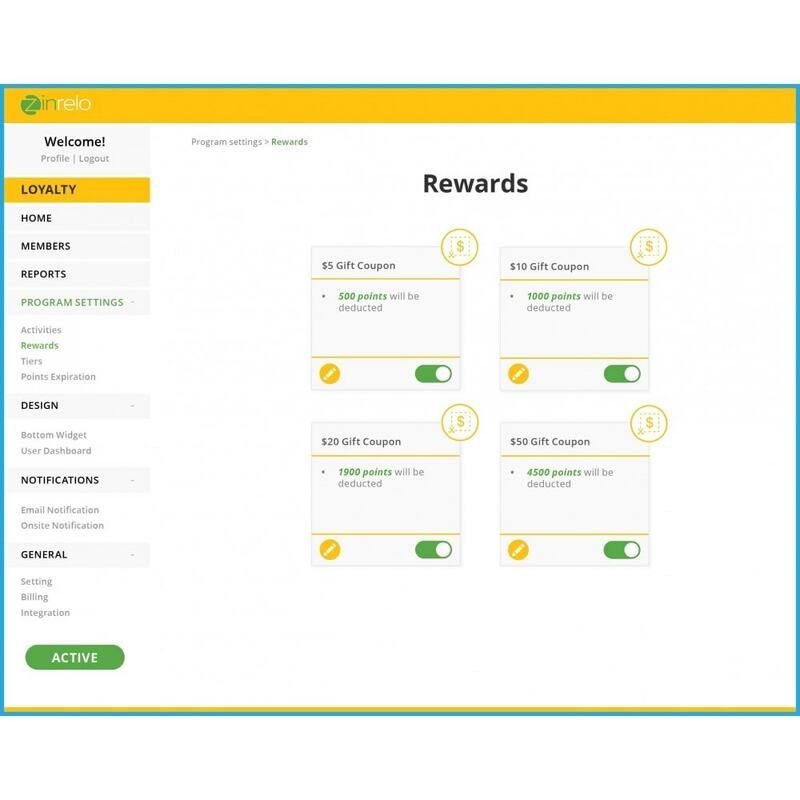 Powerful API access - Zinrelo loyalty rewards program has been developed using an API-first approach. It is the only loyalty rewards program in the world that can be seamlessly embedded within your business processes completely via APIs and Webhooks. All loyalty interactions including activities, rewards, tiers, redemptions, and account creation can be handled programmatically via API. Full service Option - Finding the right technology platform is only half the battle. 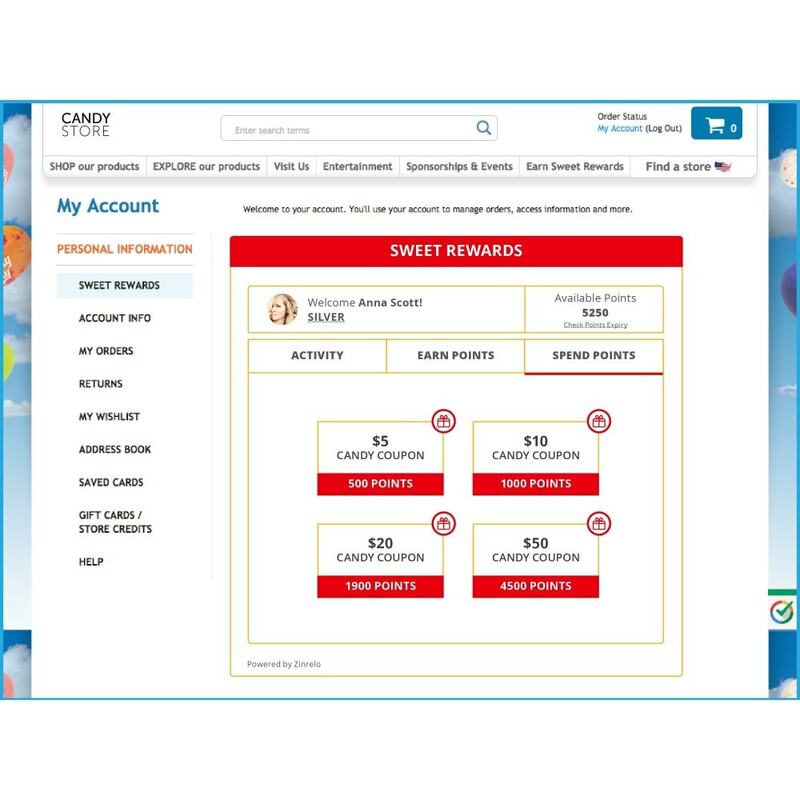 Understanding of best practices for setup and marketing is critical to the success of any loyalty rewards program. 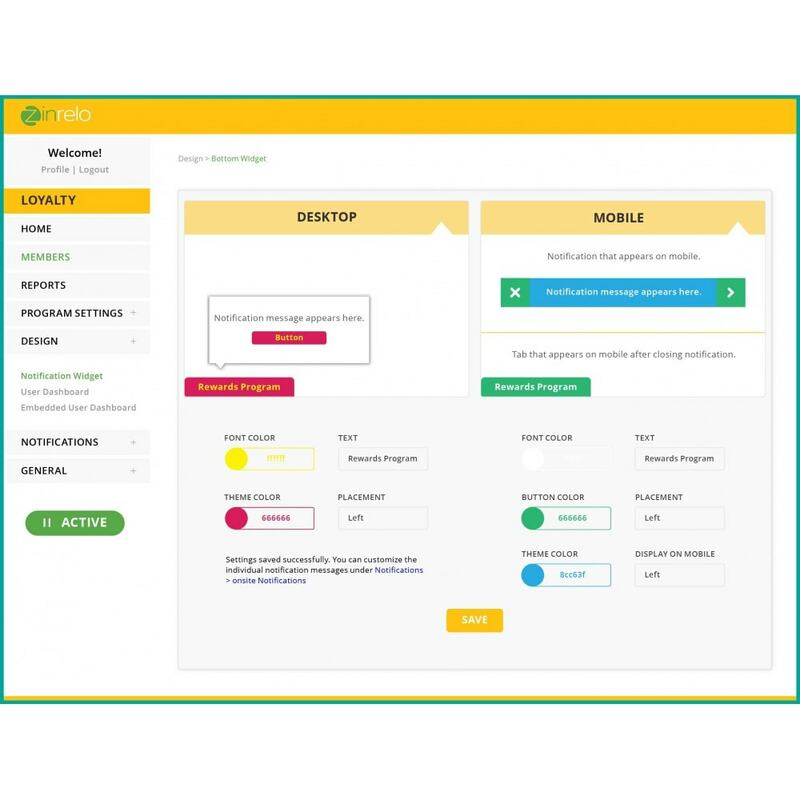 Zinrelo offers a comprehensive best practices guide and with the Enterprise Plan, it also direct access to loyalty experts to help you design a winning program. A separate Zinrelo account is required. The module will redirect you to Zinrelo to create your account and configure your program.